These classy new French-made modules are inspired by vintage designs, but they also add a few unexpected and useful features. Hacienda Labs are a relatively new French company based in Tarare, about 20 miles northwest of Lyon, and established by Stéphane Piot and Jo Verne, recording engineers at Les Studios de l’Hacienda. The company currently offer just two products, one a Studer-esque ‘vintage’ mic preamp, and the other an SSL-inspired VCA compressor, and both are constructed as 500-Series modules. The original designs were developed for Piot’s and Verne’s own use in the studios, but they proved so popular and effective that they were persuaded to put them into production. Hacienda Labs were formed to make that practical. Starting with the HL169 microphone preamp, the model number suggests it was inspired by the mic preamp in Studer’s 169 console, which appeared in the late 1970s. But while that’s true, this is very much an homage rather than a precise clone (see below for details of the circuit topology). The preamp’s facilities are pretty straightforward, starting with a continuously variable input gain control, which is marked as spanning +20 to +40 dB in its default mode (I measured the actual gain range with an Audio Precision test set at 22 to 48 dB). While this range may prove adequate for many close-mic situations it won’t be enough for more traditional mic placements, so an adjacent ‘Hi’ button introduces an extra gain stage, shifting the control’s range to offer +40 to +65 dB (the measured span actually being +42 to +67 dB). There are undoubtedly benefits to the headroom, noise and gain staging of the circuitry by working in this dual-range way, but for the end user it also brings the advantage of minimising any ‘gain bunching’ at the loud end of the control; something that can be a problem in many single-range preamps. 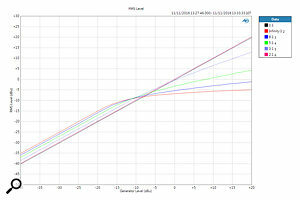 In practice, the lowest input signal level that be raised to provide a +4dBu output is -63dBu, and the highest is +15dBu (with the pad engaged but output level at maximum). The signal level metering is basic but adequate, comprising a single LED which illuminates green when the output exceeds -14dBu, and turns red at +22dBu when the unit is clipping. Most designs provide an early warning of impending clipping, but not here — when the red light shows, the signal has clipped! A rotary fader allows the output signal to be attenuated by up to 30dB, enabling the input to be deliberately overdriven, if required for some musical distortion effects, without clipping the downstream recorder or computer interface. Three more buttons select phantom power, polarity inversion and a 30dB input pad, but only the phantom button has an associated status LED. All three rotary controls have red caps, and the front panel is painted white with a black central section. Towards the bottom of the panel is a continuously variable high-pass filter which can be engaged with an ‘In’ button. The turnover frequency is adjustable from 20 to 315 Hz, and although the filter slope isn’t given in the specifications my measurements suggest it is 12dB/octave. Finally, a quarter-inch socket at the bottom of the front panel accepts an instrument input, automatically disconnecting the mic input (at the rear of the 500-Series host chassis). The instrument input passes through a FET buffer to provide an input impedance of a 1MΩ, while the mic input sees a pretty standard 1.2kΩ input impedance. The Hacienda Labs HL169 mic preamp output is balanced via a huge toroidal transformer. The circuitry is constructed on a single PCB with conventional components throughout, and is built to a good standard. A Neutrik NTM-4 input transformer accepts the mic signal while the instrument input is buffered with a BF245A N-channel FET. The main gain stage is provided by a discrete transistor front end following the topology of the Studer 169 preamp. On the output side there’s an NE5532 dual op-amp and a discrete push-pull output stage using BD139/BD140 power transistors, which drive a large Carnhill VT2499 toroidal output transformer glued to the PCB. 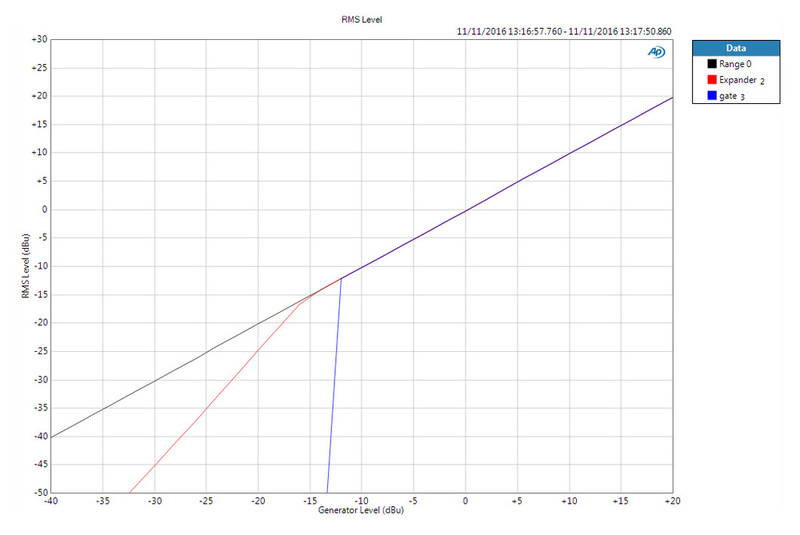 The frequency response of the mic preamp, with the high-pass filter engaged at different frequencies.In the low-gain mode, with a +4dBu output and 48dB of gain, I measured THD+N at 0.01 percent, while in the high-gain mode, with 67dB of gain (and a +4dBu output), that rose to 0.09 percent — both are very good figures. As the level approaches clipping, the second and third harmonics rise noticeably, but generally the preamp sounds very clean and neutral with more modest signal levels. I calculate the Equivalent Input Noise (EIN) figure to be a very respectable -126.5dB (A-weighted). The frequency response shows a very mild and broad HF peak of around +1dB centred at 55kHz (probably a transformer resonance), which might just be perceived by some as enhancing the sense of ‘air’. 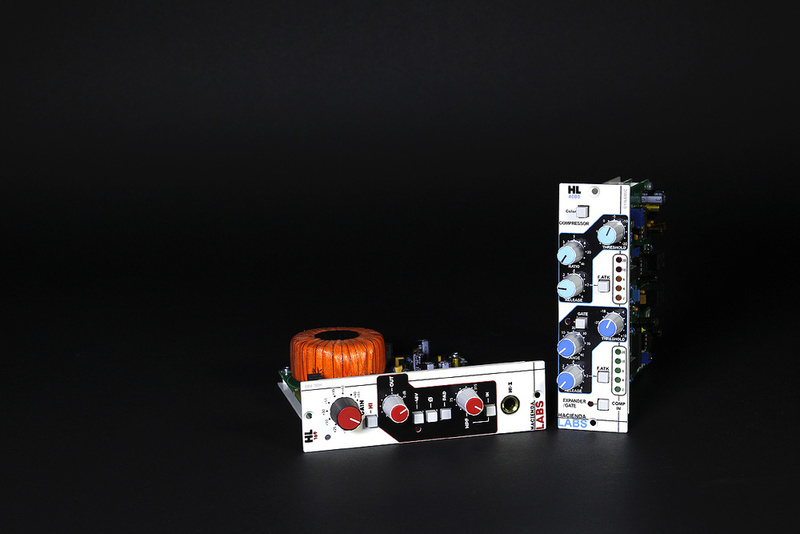 As with Hacienda’s preamp, the model name chosen for the dynamics unit gives a good indication of its design inspiration; the HL4000 module is based on the channel dynamics section of SSL’s 4000-series consoles. To differentiate the HL4000 visually from its partnering preamp, all the control knobs have blue caps, and the separate compressor and gate sections are identified within isolated black regions on the white front panel. The compressor’s operational controls occupy the top half of the module, with rotary potentiometers for threshold (+10 to -20 dBu), ratio (1:1 to infinity:1), and release (0.1 to 4 seconds). This compressor design features automatic gain make-up, so there is no control for that, but there is a button to introduce a fast-attack mode, changing the 30ms default attack time to 3ms (those times indicating the speed at which 20dB of attenuation is achieved). A second button labelled Colour alters the knee and ratio of the compressor dynamically, and is intended to provide more air and upper harmonic sparkle. The amount of gain reduction is shown on a vertical array of five red LEDs covering a 20dB range, with more gain reduction producing a higher column. HL4000: Through-hole components are used throughout. In the expander/gate section, a button (with status LED) switches between the expander and gate modes. The ratio is fixed at 1:2 for the expander mode, and 1:20 for the gate mode, while rotary controls adjust the threshold (+10 to -30 dBu), range (0 to 40 dB) and release (0.1 to 4 seconds). Another button selects a fast-attack mode, changing the default 1ms reaction time to 0.1ms (both times for 40dB attenuation). 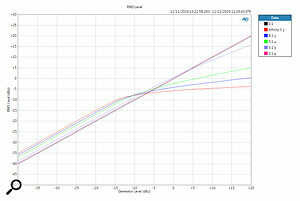 Gain reduction up to 20dB is shown on a second array of five green LEDs arranged, again, with a higher column representing more gain reduction. I know this is the way it was done in the original console, but it has always felt counter-intuitive to me; I find it easier to relate to the expansion/gating action when the GR meter progresses downwards, but that’s just a personal preference. At the very bottom of the panel another button (with associated status LED) controls a relay bypass to switch the whole dynamics processing module into circuit. Although the compressor and gate sections don’t have individual bypasses, turning the compressor ratio to 1:1 and/or the expander/gate range to 0dB prevents any response from those sections, providing an effective ‘off mode’ when required. Compressor ratios, with the Colour function engaged.The side-chain circuitry has a ‘true-RMS’ response, derived from an Analog Devices AD536 RMS-to-DC converter chip. The line-level input and output buffering is taken care of with the ubiquitous THAT 1246/1646 balanced receiver/driver chips, while the gain-reduction section is built around a THAT 2180 Blackmer VCA and NE5532 buffer. The rest of the side-chain circuitry appears to comprise a handful of discrete transistors and three TLO74 quad op-amps. 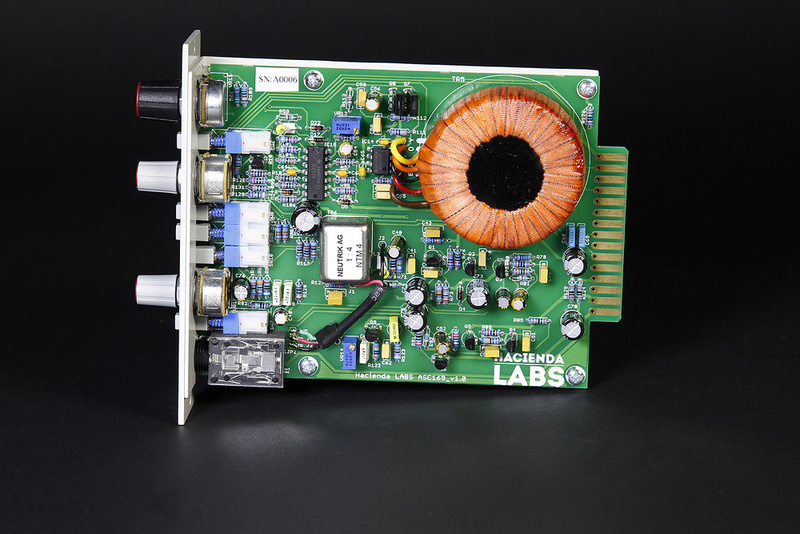 All of the circuitry is constructed using conventional components on a single PCB, with a small daughter card carrying the gain-reduction meters and, unusually, another small card mounted below the main PCB to position the 500-Series edge connector. Once again, the build quality throughout is very good. 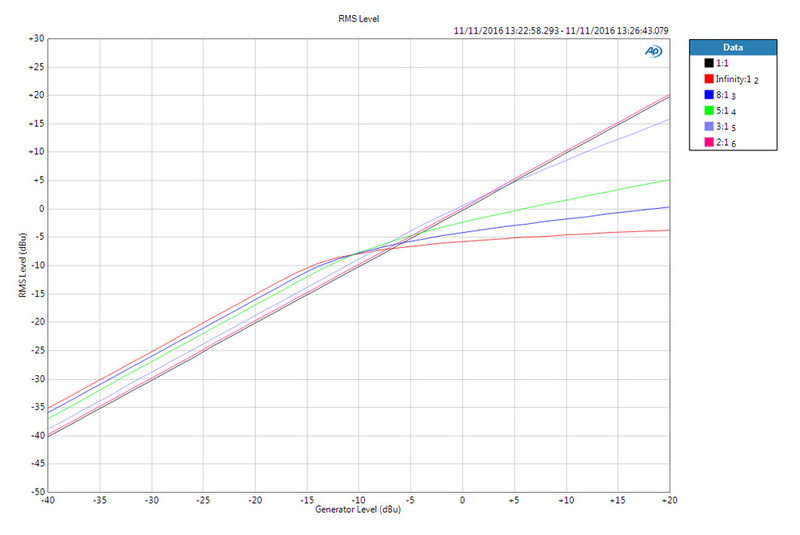 Compressor ratios, without the Colour function engaged. 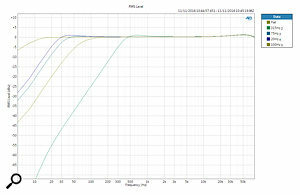 The expander/gate ratios.Working through the compressor on the test bench, the automatic make-up gain is obvious from the charts, with around 5dB introduced for the infinity ratio, and progressively less at lower ratio settings. The knee is relatively soft in all cases, but it softens further, and the ratios become a little stiffer, when the Colour mode is activated — an idea borrowed from the Neve VR console’s dynamics section, and involving a slightly different side-chain topology in the HL4000. In practice, the Colour mode seems to help enhance the richness of upper harmonics on some sources, and it is a usefully creative facility. However, there was a significant discrepancy between the ratio control’s panel markings and the actual measured ratios, which meant the unit sounded rather gentler than might be expected for any given ratio setting. For example, a ratio setting of 2:1 was almost indistinguishable from the 1:1 slope, while a setting of 3:1 measured 1.3:1, the 5:1 ratio delivered something more like 2.5:1, and the 8:1 ratio setting measured about 4:1. Testing the expander/gate side, the two ratios seemed accurate but I found a discrepancy between the panel markings for the threshold control and the actual measured threshold point. In this case, a threshold setting of -6dBu caused the gate to trigger at -12dBu, with the expander corner about 5dB lower still. The signal-to-noise ratio (with a 1:1 compressor ratio and zero gate range) measured 95dB A-weighted relative to 4dBu, which is a good result, while the THD+N figure was 0.01 percent. 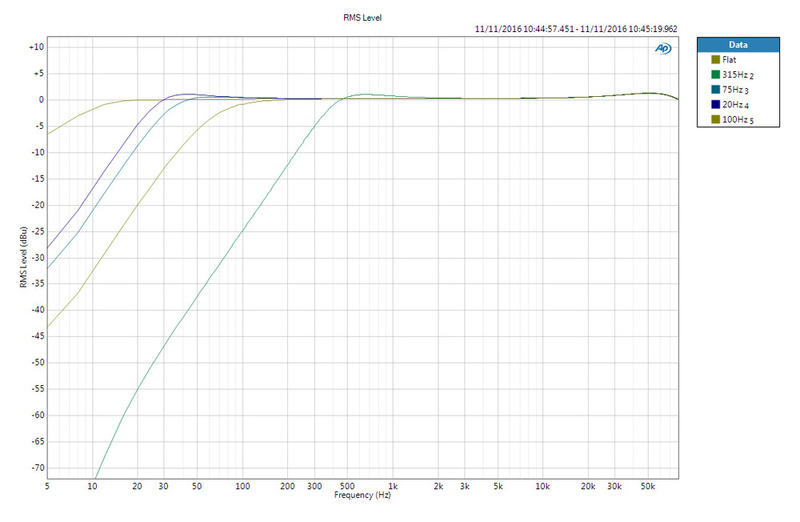 The frequency response is ruler-flat to beyond 80kHz, with a -3dB point for the low end at 7Hz. While the control-marking discrepancies are worth noting, any practical control adjustment relies mainly on what the ears hear, and for me the HL4000 is a very effective and good-sounding VCA compressor which is ideal for taming and controlling individual sources. Given any familiarity at all with the SSL style of compressor/gate functionality (real or virtual), the HL4000 is easy to set up and use and delivers the expected results. Similarly, the HL169 preamp offers a high-quality front end and, thanks to the switchable gain ranges, is rather easier to fine-tune at high gain settings than many. The metering LED isn’t as helpful as it should be, but most people will probably rely on the DAW metering when adjusting levels anyway. The instrument input sounded good, adding a little pleasant body and character to my Washburn bass, and the variable high-pass filter proved extremely effective and it was easy to find the optimum setting for any source. 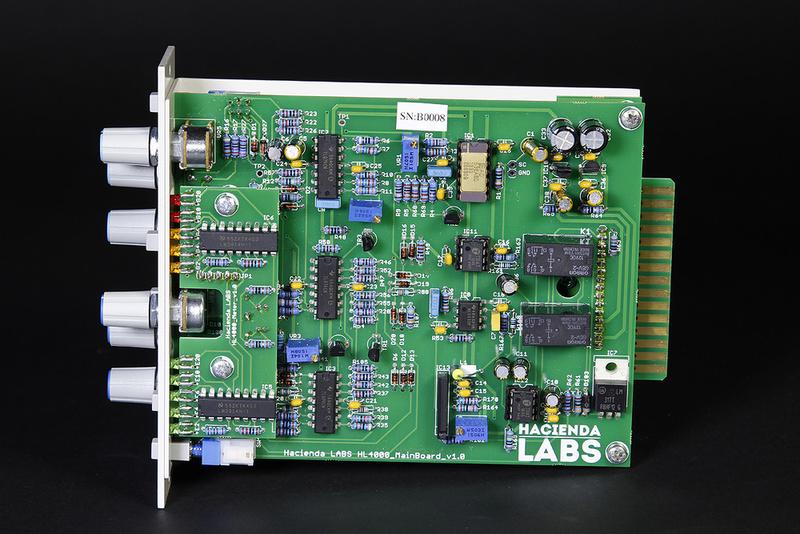 These Hacienda Labs 500-Series modules are well-made, well-designed, perform to high standards, and are very effective. I hope a partnering EQ/filter module is in preparation, because a complete channel-strip set would be a very attractive proposition indeed. Well-engineered and with good technical performance. Inspired by well-proven classic designs of the ’70s and ’80s. Dual-range preamp gain control minimises ‘gain bunching’. Continuously variable high-pass filter on preamp. 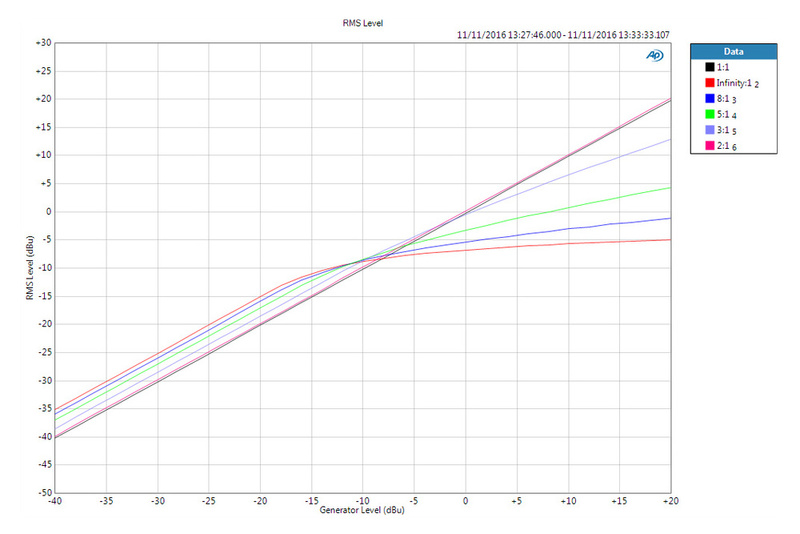 Dynamics module’s Colour mode emulates Neve VR compressor characteristics. Control panel markings not as accurate as they should be. Preamp level meter could be more informative. These well-engineered modules combine to form a very competent mic preamp and channel dynamics section, both inspired by classic designs of the ’70s and ’80s. Let’s hope there’s an EQ to follow! HL169 €562.80; HL4000 €526.80. Prices include VAT. HL169 €469; HL4000 €439. Prices exclude tax and shipping. Hacienda Labs +33 9 50 59 60 36.